This statement has been prepared after the meeting at the request of the National Parliament Bipartisan Committee to provide a record of the issues and concerns of the Wakunai community leaders, both male and female, expressed at the meeting by Mr. Akoitai and by other leaders of the Wakunai Community. The Bougainville Crisis began because of concerns of Bougainvilleans about environmental damage of the Panguna Copper Mine without fair compensation for Bougainville under the mining agreement made between the Australian Colonial Administration and Conzinc Riotinto Australia (CRA) without any voice for the Panguna and other impacted landowners, or for other Bougainvilleans. There is clear evidence of the impacts and the unhappiness of the people in films, newspapers and documents from the time. The Colonial Administration gave a limited recognition to the concerns of the people by agreeing to Sir Paul Lapun’s 1967 demand for 5 per cent of royalties to go to landowners, by increasing the compensation and occupation fees a little from the small amounts originally offered, and by the 1971 imposition of a ‘moratorium’ on further exploration or mining development other than what had already been authorised for Panguna. But none of this went anywhere near to meeting the concerns of landowners and other Bougainvilleans. From the late 1960s concern about the mine being forced on Bougainville, mainly for the benefit of the rest of PNG, added strongly to already existing support for Bougainville’s independence. Independence support had been developing for many years before that as Bougainvilleans became increasingly aware that artificial colonial borders separated Bougainvilleans from their relatives in Solomon Islands and made them part of PNG without their agreement. The demand by Francis Ona in 1988 for K10 billion compensation for the damage caused by the mine expressed the anger of the Bougainville people about the impacts of the mine. The refusal of BCL and the National Government to listen to that demand, and the violence of the Police Riot Squads sent to Bougainville from the end of 1988 resulted in greatly increased support for Bougainville independence. This is the history that caused deaths of many Bougainvilleans and people from other parts of PNG, and massive destruction in Bougainville. Many believe as many as 20,000 Bougainvilleans died. Bougainvillean families and communities were divided. Brother killed brother. In my place sons even killed their own fathers. Many very important leaders died violent and completely unnecessary deaths. They included Ken Savia and Theodore Miriung, then Premier of the Bougainville Transitional Government, who was striving to build peace. He was assassinated by members of the PNGDF and the Bougainville Resistance Forces. The outcry over his death, in Bougainville, PNG and internationally, led to an inquiry into his death by a judge from Sri Lanka. It identified those involved, but has never been made public. No prosecutions ever occurred. Deaths of other senior leaders since the conflict ended were in large part caused by the stresses of the conflict, including those of Francis Ona and Joseph Kabui. The conflict, which ended in 1997 (almost 20 years ago) is now history. It was ended by the Bougainville Peace Agreement, signed on 30 August 2001, more than 15 years ago. It was after four years of hard work by both Bougainvillean and PNG leaders to build peace. So it was a joint creation of both PNG and Bougainville. Key leaders contributing on the PNG side included Prime Ministers Skate and Morauta, and ministers for Bougainville Affairs. I was the first of those, and followed by Grand Chief Sir Michael Somare and Sir Moi Avei. Key leaders on the Bougainville side included Chief John Momis and Joseph Kabui. Our efforts in building peace and signing the Peace Agreement would not have been possible without support from the international community. As first Minister for Bougainville Affairs during the peace process, in late 1997 I negotiated on behalf of the National Government to establish the regional mission – the New Zealand–led Truce Monitoring Group (TMG) which also included Fiji, Vanuatu and Australia. The TMG and then its successor the PMG were in Bougainville from November 1997 to June 2003. Early in 1998 I was also involved in negotiating for a United Nations observer mission. It was present in Bougainville from mid-1998 to June 2005. These contributions of the international community, together with strong financial support from many donors, enabled the very divided parties to begin to trust and work with one another and then to slowly negotiate for the Peace Agreement. Both the PMG and the UN observer mission played key roles in facilitating the negotiation process. They reported back regularly to their home governments in the region, and to the United Nations. The progress of the Bougainville Peace process was discussed regularly in the United Nations Security Council. To overcome the many divisions that had caused, or arisen during, the conflict both the PNG National Government and the Bougainville leaders made many compromises on key issues. Those compromises by both sides are recorded in the Peace Agreement. The parties committed themselves to all the things in the long Agreement when they signed it in Arawa on 30 August 2001, in the presence of many international leaders. The Agreement was endorsed by the United Nations Security Council, and the United Nations continues to follow closely the progress being made in implementation of all aspects of the Agreement. The commitments from the National Government and the Bougainville leader in that Agreement were approved by the PNG Cabinet and by the Bougainville political leadership before the signing. After the signing, as had been provided for in the Agreement, officials of both sides formed a joint technical committee to oversee the drafting of the Papua New Guinea Constitutional Laws that gave force to the Agreement. Those draft laws were unanimously approved by votes of the National Parliament early in 2002. The requirements of the Peace Agreement are now just as much a part of the PNG Constitution as the provisions that create the National Parliament or the Supreme Court. It is those Constitutional Laws that created the political structures of the Autonomous Bougainville Government (ABG), and elections for its House of Representatives. The laws also provide for the calculation and payment of National Government grants to the ABG. The existence of those grants, and how they are calculated each year, are not just matters of agreement, or of negotiation as part of the annual PNG budget. No – they are things clearly stated in the National Constitution. If the National Government does not comply with the financial commitment in the Peace Agreement and the Constitution, then it is breaching the National Constitution. During the negotiation of the Peace Agreement, and in the two or three years after it was signed, there were many awareness programs in Bougainville about the Peace Agreement, weapons disposal, and the making of the Bougainville Constitution. But after the ABG was established in June 2005, awareness programs stopped for a long time. As a result, many Bougainvilleans have limited understanding of what is in the Peace Agreement. At the same time, arguments between the National Government and the ABG about such things as the calculation of grants due to the ABG, or issues about the future of the Panguna mine and Rio Tinto shares in BCL, add to the difficulties of Bougainvilleans understanding the Peace Agreement. They make them loose faith in the Agreement. The National Government sometimes seems to believe that it can make decisions about matters in Bougainville that the Peace Agreement makes clear are responsibilities of Bougainville. It seems to forget that the Autonomous Bougainville Government, and its powers and responsibilities to make decisions for Bougainville, come from the National Constitution. On behalf of the leaders of Wakunai, I call on the National Government and the ABG to work closely together to implement the Peace Agreement, and the provisions of the National Constitution. They particularly need to cooperate now, as we head towards the Referendum. In setting the date for the referendum within the five years from 2015 to 2020, the ABG needs to meet good governance, weapons disposal and fiscal self-reliance benchmarks. In addition, because the Peace Agreement and the National Constitution require the Referendum to be ‘free and fair’, much needs to be done in terms of weapons disposal, good governance, and establishing basic respect for the rule of law. The main objective of the Peace Agreement is to achieve restoration of total peace within Bougainville and between Bougainville and Papua New Guinea. For that to happen, the National Government must do two main things. First, it must do everything needed to give Bougainvilleans full faith in the ABG – only in that way can Bougainvilleans judge whether autonomy really meets their needs. Second, it must fully support the agreed, constitutionally based referendum arrangements. Those arrangements were included as part of the compromises that all parties made. If what was agreed about the referendum is not honoured, progress towards restoration of peace will stop. That will be a recipe for a return to conflict. The National Government must assist the ABG and the people of Bougainville in carrying out a reconciliation process in Bougainville before the referendum is held. The National Government must avoid dealing with Bougainville issues unless it does so through the ABG, or with its agreement. There is no other way of dealing with Bougainville issues. 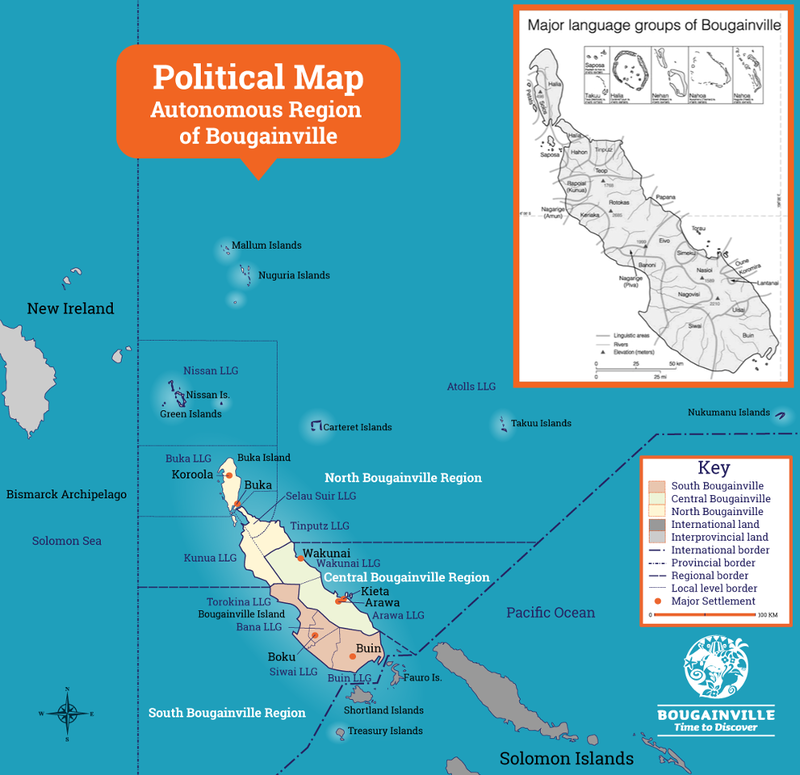 Bougainville is not a province, the ABG is no a provincial government. No – Bougainville is an autonomous region, and the ABG has full autonomy to decide matters given to it by the PNG Constitution. The Peace Agreement states why we agreed to autonomy – it was to empower Bougainvilleans to solve their own problems and realise their own goals. The ABG was the main institution established to enable Bougainvilleans to do this. When the National Government refuses to work with the ABG, or attacks the President for speaking up on behalf of Bougainville, the chances of the Agreement bringing peace are undermined. It is heartbreaking to hear statements made by certain National Government leaders attacking the President of Bougainville. He was voted by more than 60,000 Bougainvilleans. As a defeated presidential candidate, I fully recognise him and support him as the true leader of Bougainville. Not only is he President, he is also a paramount chief, and deserves nothing but respect. The recent decisions made about the 17.4 per cent Rio Tinto shareholding in BCL are an example of what happens when the National Government ignores the ABG. The National Government has refused to listen to the ABG, and has interfered in Bougainville’s internal affairs in ways that could cause serious problems and internal conflict. And yet the 17.4 per cent BCL shares are almost worthless. The whole Rio Tinto issue was badly handled by the National Government. It negotiated direct with Rio Tinto without consultation with the ABG. It allowed Rio to walk away without dealing with environmental damage, the terrible problems of relocated villages, and other legacy issues. The 17.4 per cent Rio shares issue is seen by most Bougainvilleans as evidence of a divide and rule tactic by the National Government. The landowners now are left with all the legacy issues, and shares worth nothing. Yet other Bougainvilleans think those same landowners should be contributing compensation for those who died during the conflict. Under the Peace Agreement, the Joint Supervisory Body (JSB) is intended to be the main body that implements the Agreement. It is also supposed to deal with disputes between the two governments. So it is an important institution. It cannot be treated as just a rubber stamp for the National Government. There are now so many major issues where the ABG and the National Government are in dispute. They include the calculation of the Restoration and Development Grant and other grants, revenues from migratory fishing licences associated with Bougainville, and the Rio shares issue. The National Government must seriously engage with the ABG to resolve these and other major outstanding issues as soon as possible, and certainly well before the referendum. There are also many serious issues about the referendum that have to be negotiated and decided before the Referendum can be held. They include the question or questions to be asked, and the qualifications for non-resident Bougainvilleans to enrol to vote. The National Government must also engage seriously with the ABG on these matters, and must do so as soon as possible. Because of internal conflict in Bougainville, I ended up fighting against some of my own people, in support of the National Government. I worked with over 4,000 others in the Bougainville Resistance Forces. I shed the blood of some of my own people. We negotiated the Peace Agreement to end all of this. If the National Government fails to implement the Agreement in full, it will be a betrayal of me and my more than 4,000 brothers who supported the National Government during the conflict. Now it is time for the National Government to assist me, just as I assisted the National Government – it must fully implement the Bougainville Peace Agreement, in partnership with the people of Bougainville. It is truly remarkable that at last that you have realised the importance of your people but it is still questionable. You surely cannot deny from your past history that you were a key player who supported the mining company as the former resistance leader and Minister for Mining. You have clearly stated that: “Theodore Miriung, then Premier of the Bougainville Transitional Government, who was striving to build peace was assassinated by members of the PNGDF and the Bougainville Resistance Forces”. You were the leader of the Resistance at the time and no doubt you were influential in the assassination of the late Theodore Miriung. You also state, that an inquiry into the death of the late Theodore Miring by a judge from Sri Lanka “identified those involved, but has never been made public” and no prosecutions ever occurred. You now insist that, the National Government of PNG should assist you, and you said, “just as I assisted the National Government – it must fully implement the Bougainville Peace Agreement, in partnership with the people of Bougainville”. It seems obvious you are still manipulated by the mining company and their filth. BY BOB AIKEN, 18 November 1996. SYDNEY, Australia – Theodore Miriung, Bougainville Transitional Government (BTG) premier, was assassinated in southern Bougainville October 12. Eyewitnesses saw gunmen fleeing the scene being picked up by Papua New Guinea (PNG) military transport and taken in the direction of the PNG army base nearby. There have been reports of up to eight PNG soldiers being in the vicinity of the killing, along with at least one member of the “Resistance” militia organized by the PNG army. Miriung was one of the leaders of an independence movement on Bougainville in 1975-76 that won a degree of autonomy as a province within the newly independent Papua New Guinea, a colony of Australia until 1975. He rose to become an acting National Court judge, but returned to Bougainville in 1990 after the war for independence had begun. Later, in 1994, he broke with the Bougainville Revolutionary Army and the Bougainville Interim Government (BRA/BIG) to enter negotiations with PNG and establish the BTG. Miriung was appointed Bougainville premier in early 1995 by the PNG prime minister Sir Julius Chan. Miriung was murdered as the independence movement, led by the BRA/BIG, has dealt sharp blows to the PNG’s military operations. Conflicts between Miriung and the PNG authorities had also deepened. Last June, Miriung publicly opposed a major PNG military offensive, the largest of the seven year war. He has also condemned conditions in the “care centers” set up by Port Moresby, where up to 70,000 of Bougainville’s population of 160,000 have been resettled. Port Moresby is the capital of Papua New Guinea. In August, the PNG army blocked Miriung at gun point from addressing the opening of the Inter-Church Women’s Forum held in the Bougainville capital of Arawa. The August 25-31 gathering of 700 women from across the PNG-held part of Bougainville demanded that they be given a role in peace talks, and called for the closing of the care centers and the withdrawal of PNG troops. BRA/BIG president Francis Ona strongly denied allegations from PNG Defense Force commander Brigadier-General Jerry Singirok that the BRA was involved in the assassination. “The assassin’s motive strongly points towards two factors: Miriung’s hard stand against the military solution by PNG on Bougainville, and the stalling of the current peace process, of which Miriung was the thin link between the BIG/BRA and the Papua New Guinea government,” Ona said in a statement released October 13. The BRA and BIG had “fully supported Miriung’s efforts, dropping all doubts about his intentions,” Ona said, pointing to the two rounds of talks that had taken place between the BIG and BTG in Australia in late 1995. “Both sides in Bougainville” had been “devastated” by the killing, Moses Havini, the BIG’s Sydney-based international representative said in a phone interview with the Militant. “The onus is on the PNG government to let the world know if any of their members were involved. The culprits must be brought to justice,” he said. “Putting the peace process back on track would be our first priority”, Havini said, something that “the PNG government was already working aggressively” against before Miriung was killed. “PNG relies heavily on Australia to continue” the war, Havini said, calling for continued pressure on Canberra to halt military aid to Port Moresby. Bougainville is the site of a giant copper mine, closed by the war, owned by the Anglo-Australian corporation CRA/RTZ. There are a number of major Australian-owned enterprises in PNG. The Australian government has supplied nearly $200 million in military aid to Port Moresby since 1988. Despite this, the war is a major reason for the sharp financial crisis that is wracking the neo-colonial government in Port Moresby. In recent years, Canberra has also sought to broker a peace settlement short of granting Bougainville independence.